Six marine aftermarket products were honored for innovation at this year’s Marine Aftermarket Accessories Trade Show, held July 16-18 in Las Vegas. A total of 60 new products were entered, with winners chosen in six of eight possible categories. Jan Mundy, Innovation Awards chair and editor of DIY Boat Owner magazine, said it’s not unusual to not have winners in all possible categories, because the criteria for the awards are very specific and strict. Award winners may not be products that have been slightly upgraded; they must be substantially different from other products being manufactured. Also, the products must be cost-effective, practical and beneficial to the marine industry and consumers alike. And the products must be made available to consumers within 60 days of the conclusion of the show. In the Aftermarket Electronics category, Lowrance-Navico was honored for the Broadband Sounder I. The device uses software and high-speed signal processing to distinguish fish targets from the boom and to depths never before achieved, the judges said. Lowrance also received the honorable mention in this category for its LVR-880 fixed radio. This is the first dual VHF and FM radio that also integrates NMEA 2000 with DSC for distress and buddy tracking. In the Boat Care/Coatings/Chemicals and Maintenance Tools category, Mark Silvey Marine Services was rewarded for its Re-Structure Marine Polish. This non-petroleum, water-based penetrating polish uses nanotechnology to clean and protect gelcoat, metal, paint, plastic, vinyl and other hard surfaces. Eclipse Marine Products’ T-Top Extender received an honorable mention in this category. The T-top Extender doubles the shade area, offering sun protection to passengers seated in the bow or stern. In the Interior Parts category, Delta T Systems was recognized for its Dry Boat DC-powered dehumidifier system, which uses Peltier thermo-electric cooling technology. One-third the size of a conventional unit, it’s designed to be portable or permanently mounted and discharge water drains into a sink, the bilge or overboard. An honorable mention in this category was awarded to the Comfort-Mate toilet from Thetford Marine. It features a detached pump unit that allows mounting in a remote location. Aqualuma Underwater Lighting’s Aqualuma Brake Light System took the prize in the Safety Products category. This LED light system automatically signals when the operator releases the throttle for at least one-half second and a manually activated SOS mode lets users signal for assistance. 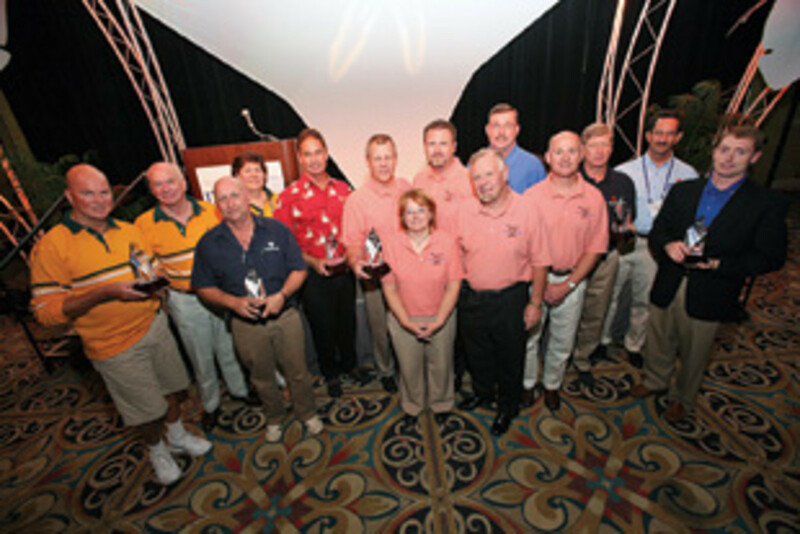 Honorable mention in the Safety Products category was given to ACR’s GlobalFix iPRO 406 EPIRB. A digital display provides users with a readout of self-test results. If activated, the EPIRB displays GPS coordinates, remaining battery power and deployment tips. In the Trailer Parts and Accessories category, Cequent Performance’s F2 2000, a full-featured winch, was honored. The product delivers improvements in both form and function, including: café-free operation, a fully adjustable handle that’s easily repositioned for left- or right-handed operation, quick installation via carriage bolts without removing the strap and a pull-and-turn knob to engage and release the gears. Honorable mention in this category was given to The Big Stick from How Do We Do It. This patented trailer theft deterrent consists of two components: a hub unit that mounts over the wheel lug nuts and a heavy duty “stick” that slides over the hub and locks in place. In addition to Mundy, judges for the Innovation Awards were: Charles Doane, editor-at-large, Sail magazine; Ben Ellison, electronics editor of Power & Motoryacht and author of the electronics blog Panbo.com; Alan Jones, executive editor, Boating World; Zuzana Prochazka, staff writer, Latitudes & Attitudes; Randy Vance, editor-in-chief, Boating Life; and Alan Wendt, editor, Marine CEO.